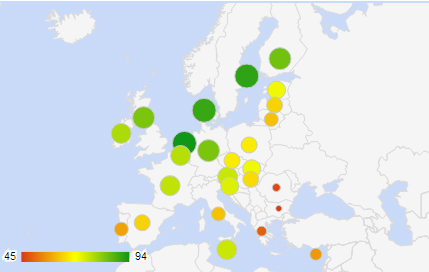 AccuraCast SearchStarz Blog: Is Internet a key determinant of a country's GDP? The internet is a form of media with unknown potential. Every year, the number of people gaining access to the Internet is increasing across the globe - in developed countries, developing countries and also third-world nations. To determine the importance of the Internet, we should consider many factors, from the percentage of sales occurring via ecommerce to the effect of online efforts on offline sales and the subsequent publicity generated from this. We must also consider the Internet’s influence as a tool for gaining knowledge, as it facilitates easier transmission of information to anywhere on the planet. Many variables determine the potential of the Internet, but can we say that greater Internet access for the population of a country is related to its GDP per capita? Using data we will determine the answer. 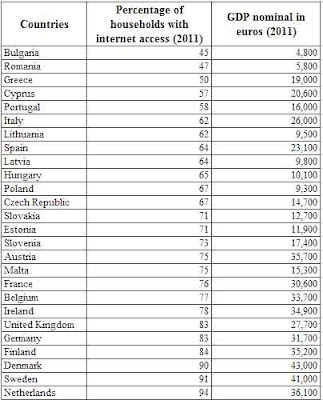 The table below has been obtained from National Statistics Institute of Spain and depicts the percentage of households with Internet access for each EU country. 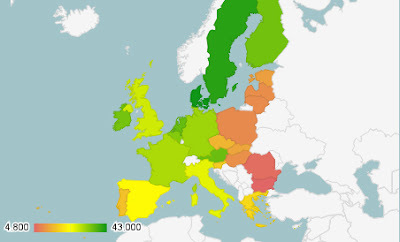 It also includes data from the Statistical Office of the European Union (EUROSTAT) on the gross domestic product per capita nominal per country. Placing the data in these two columns onto the same graph enables us to examine the correlation between the level of GDP and the percentage of the population that has Internet access. In particular, the Nordic countries have the highest percentage of households with Internet access with an average of 90%, on the other hand, the countries of Southern and Eastern Europe have a lower percentage. 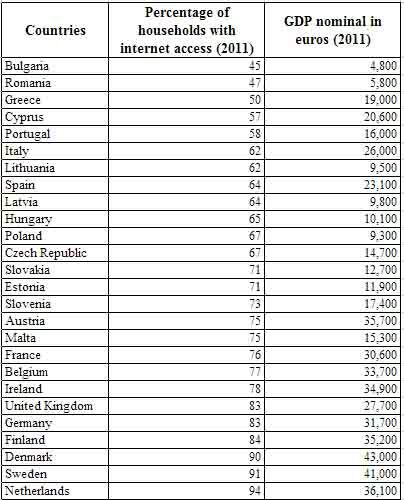 Though, there are some exceptions, such as Malta with low GDP and high percentage of households with Internet access and Italy with a strong economy and a relatively low percentage of per capita Internet access compared to the European average. In summary, there is a clear relationship between these two variables. We can conclude that increased exposure to the World Wide Web allows us to gain greater knowledge, which increases our skills and enables us to be more productive. The combination of the factors allows us to stimulate economic development and drive our GDP.